Hard luck to Sinead Goldrick, Amy Connolly, Niamh Collins, Hannah Noonan, Niamh Ryan and their Dublin team mates on losing to Cork in the All-Ireland Final on Sunday. Losing to Cork for the second year in a row is tough to take but weâre sure our ladies and their team mates will be back stronger than ever next year to beat this outstanding Cork team. Well done also to the 300+ supporters from the club who made their way to Croke Park for the game. The next big outing for the club will be the Leinster Club semi-final when our senior team take on the Wexford or Meath champions and we look forward to seeing similar number travelling that day to support the team. 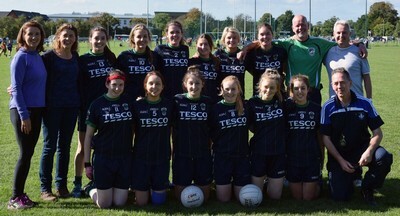 Last weekend saw our senior and junior teams taking part in the All-Ireland 7âs competition. Our senior team played in group 3 of the Senior 7âs along with Donaghmoyne (Monaghan), Kilmore (Wexford), St Brendanâs (Galway) and Annaclone (Down). Our Juniors played in group 4 of the Junior 7âs along with Kilcock (Kildare), Galbally Pearses (Tyrone), Castleknock (Dublin) and Austin Stacks (Kerry).The juniors narrowly missed out on a place in the junior shield competition but our seniors made it to the final of the senior shield competition but lost out narrowly to Kiltubrid. A great day was had by both squads! Best of luck to Sinead Goldrick, Amy Connolly, Niamh Collins, Hannah Noonan, Niamh Ryan and their Dublin team mates when they take on Cork in the TG4 All-Ireland Ladies Football final on Sunday next (Sep 27th) in Croke Park at 4 p.m. There is a great buzz around the club for this game and at the time of writing, we have 3 busloads of supporters travelling to the game. Commiserations to our junior team who were beaten in the Division 5 Cup final on Wednesday evening last by Ranelagh Gaels. It was a fantastic game with the result in the balance right up until the end. The season is far from over for this team though as theyâre still in contention for the division 5 league. A reminder to all players that it is mandatory for gum shields be worn during training and games. Could any members who as of yet have not paid their fees to the Club please do so as soon as possible and no later than September 30th. If you have any issues with paying, please contact the Club Registrar in total confidence to discuss an arrangement before this date. After this date the Club will assume that those who have not paid do not wish to continue with their membership. Please forward cheques or arrange cash payment with the Club Registrar. Note the Club will be moving to payment on-line only next year via myclubfinances.com. 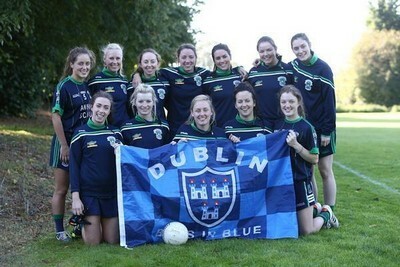 As members are no doubt aware, the Dublin Ladies Senior Football team have qualified for the All-Ireland Final for the second year in a row. As a club we are very proud to have 5 players on the panel: Sinead Goldrick, Amy Connolly, Niamh Collins, Hannah Noonan and Niamh Ryan. The All-Ireland Final is on Sunday September 27th @ 4 p.m. in Croke Park and the club will be ordering tickets and running buses to Croke Park for the final. Adults â¬15 (NOTE: Adult tickets cost â¬25 but the club are subsidising the cost of these tickets). The cost of the bus is â¬5 per person return. Each team should have been contacted by a representative of their management / team mentor group to gather numbers, per age group. Each team has been asked to return the final numbers to the co-ordinators, Paul Ryan and Colette O'Keefe, by Wednesday September 17th to enable a ticket order be placed with Croke Park. If you would like to go the game, it would be great if you could reply to the correspondence you got from your team representative ASAP. Best of luck to our Junior team when they play Ranelagh Gaels in the Division 5 Cup Final on Wednesday. The game is in Bellfield with the throw in at 8:00 p.m.
On Saturday our U10âs travelled to Cork to play in the Passage West Tournament. A great day was had by all. Photos and a report on the day will be posted to the club website soon. What a fantastic day! After a few years absence, the Family Fun Day resumed better than ever. All who were present in Kilbogget agreed that it was a marvellous occasion for the club. Sincere thanks to the organising committee of Denise OâConnor, Naomi Murphy, Colette OâKeefe, Mags Walsh and Linda Carroll. The ladies have volunteered to organise another social event before Christmas so keep an eye on these notes for more information about this. Thanks also to the numerous helpers who manned the stalls, tidied up and helped moved furniture etc. We were honoured to have Dublin Ladies Gaelic Football Association secretary Mary OâConnor spend the afternoon with us. With the Dublin Ladies Senior football team having qualified for the All-Ireland final, Mary is going to be a very busy lady in the next 3 weeks so we really appreciate her making time in her busy schedule to spend time with us. Mary brought the Leinster Senior, Leinster Minor and U21 All-Ireland trophies with her. The Dublin Ladies Senior Championship trophy was also present and a lot of the younger members got their photos taken with these trophies. As members will know, weâre 10 this year and itâs a lovely co-incidence that we have 10 girls represent the club on various Dublin teams from U12 to minor this year. To acknowledge their selection, the club made a presentation to each girl and Mary OâConnor did the honours by presenting the girls with their pennants. No party would be complete without a cake, and the cake that was supplied by Leona Campbell from Cupcake Heaven had to seen to be believed (see the picture at the end of this mail). It looked too good to cut but weâre glad we did because it tasted as good as it looked! As ever, the Cornerstone Cup game between an amalgamation of the Minor and Junior teams against the mentors and parents was the highlight of the day. Since the initial Cornerstone Cup a number of years ago, the playersâ team have always won so the mentors and parents team, under the management of Keith Hughes, were determined to break that winning streak. Thing were looking good for the mentors / parents team as they had a comfortable lead at half time. The Minor / Junior team made a great start to the second half and were level with 5 minutes to go. Mick Egan got a goal for the mentors / parents team a couple of minutes later and it was looking like the mentors / parents team were finally going to win the cup. The Minor / Junior team werenât going to give up that easily and they came down the field and Hannah OâNeill scored a point to leave just 2 points between the teams. Goalkeeper (and club chairman) Johnny Culloty tried to slow things down by tying his laces but referee Emma Hughes knew what he was up to and insisted that he kick out the ball. The subsequent kick out was intercepted by Ciara Crotty who passed the ball to her county minor teammate Tarah OâSullivan who blasted the ball to the empty net to see the Minor / Junior combination continue their winning streak. Congratulations to Sinead Goldrick, Amy Connolly, Hannah Noonan, Niamh Collins, Niamh Ryan and their Dublin team mates on qualifying for the All-Ireland Senior Football Final. The final is in Croke Park on September 27th and we would like see all club members make their way to Croke Park that day to cheer on the ladies and their team mates. Members will be updated regarding tickets for the final in the next few days. The club encourages all team to play challenge games if they have a free weekend. All team mentors should note that for challenge games within Dublin, permission must be sought from Dublin Ladies Gaelic Football association. For challenge game within Leinster, permission needs to be sought from the Leinster Ladies Gaelic and for challenges outside of Leinster, approval needs to be sought from Ladies Gaelic Central Council. Permission from these bodies need to come from the club secretary. While reviewing the clubâs policies and procedures earlier this year, the sub-committee tasked with this suggested that a sub-committee be set up to review the constitution. If any member would like to be considered for this sub-committee, could they please mail secretary@foxcabgaa.ie expressing an interest. In keeping with agreed club procedures, the club committee are inviting applicants to apply for the position of Manager of the above team. This team is being re-introduced for championship having not fielded in the league campaign last spring. The closing date for applications is 6 PM Wednesday next September 9th. To apply, please e mail Linda Carroll our club secretary on secretary@foxcabgaa.ie. Interviews will take place within days of the closing date. Our current Under 8 panel (born 2007) is currently part of our club academy, managed by Derek McArdle. As this group will be graduating from the academy in the weeks ahead, the club wish to appoint a lead mentor and a backup management team for the years ahead. In keeping with agreed club procedures, the club committee are inviting applicants to apply for the position of lead mentor for this age group. The closing date for applications is 6 PM Friday next September 11th. To apply, please e mail Linda Carroll our club secretary on secretary@foxcabgaa.ie. Interviews will take place within days of the closing date.